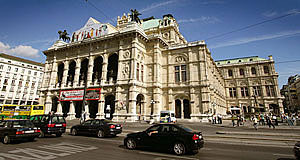 What is called the "Wiener Staatsoper" ("Vienna National Opera") used to be the "k.k. Hofoper" (Imperial and Royal Court Opera) in the days of the Habsburg Empire - in any case, the Viennese referred to it as "the first house" by the Ringstraße road. This refers to the opera as being the most exclusive, significant and noble institution of Austria as well as the oldest of the large, public buildings that were constructed in the late 19th century. The Staatsoper is one of the most important opera houses in the World and the pride of Austria, particularly the Viennese. The "Wiener Philharmoniker" (Vienna Philharmonic Orchestra) consists of members from the Staatsoper′s orchestra staff, the ballet ensemble is probably the best outside of Russia (consisting primarily of Russians, anyway). The famous "Vienna Opera Ball" or Wiener Opernball is organised in the opera every year. Last but not least, the Staatsoper offers top-notch productions of opera with very reasonable prices: Standing room tickets go for only 3.50 Euros. As stated above, the Staatsoper was the first of several large public buildings along the Ringstraße. The winning design was in Italianesque neo-Renaissance style to re-call Italy as the birthplace of opera. The two architects responsible for the plans were a gay couple named August Sicard von Sicardsburg and Eduard van der Nüll. Construction work started in 1861. Unfortunately, the design proved to be very unpopular with the Viennese. To make things worse, the level of the Ringstraße was elevated by one meter during the construction, making the opera "sink" under ground. In reaction to hostile (or deserved, depending on your own view) criticism, van der Nüll committed suicide and ten weeks later, von Sicardsburg died from a heart attack. Therefore, the two architects did not experience the completion of their opus. The Staatsoper′s opening night was celebrated with a production of Mozart′s Don Giovanni on the 15th of May, 1869. In 1922, the Staatsoper got its current, Republican name due to the lack of an Imperial Court. In 1945, heavy bombardments hit Vienna: American bombers tried to destroy refineries in Floridsdorf. Unfortunately, an opera house seems to resemble a refinery from above - the Staatsoper was blown up and the interiors seriously damaged. Only the façade and front side was not harmed, because it had been covered as a precaution. Nevertheless, the Austrian authorities were not sure whether they should attempt to refurbish the building or re-build it from scratch after the war had been over. With opera being a big deal in Austria, the chancellor Leopold Figl himself decided to re-furbish the existing building with modest alterations. In order to achieve better acoustics than in the original building, the main material used for the refurbishment was wood. Pillars were removed and the number of seats was reduced. Otherwise, the Staatsoper of the Second Republic did not change a great deal. During destruction and refurbishment, the ensemble continued to perform in the Volksoper opera house and the Theater an der Wien by the Naschmarkt. As early as in 1947, the Staatsoper ensemble toured Europe with highly successful productions. Continue with "Wiener Staatsoper - Part II"